Fume describes its self as laidback, serving ‘the type of food your mama would make’. The restaurant is unashamedly hip: there’s exposed pipe and brickwork, along with a part-open pastry kitchen. The furniture is minimalist and old fashioned – expect basic wooden table and chairs, simple cutlery served in a metal tin, and food that comes laid out on chopping boards. For its Christmas set menu, Fume plays on nostalgic tastes – as such, there’s plenty of traditional festive dishes. Make sure you arrive hungry. If you partake in the festive brunch – which runs over 23-26th* – you will be served all of the large 12 courses available on the menu. Standout dishes were the smoked salmon terrine and red onion marmalade starter, turkey breast roulade, trimmings and cranberry compote, charred Brussels sprouts and the panettone with cinnamon and mascarpone cream. For the mains be sure to ask your waiter for gravy to balance the meats and Yorkshire puddings. Many of the staff at Fume have worked at the restaurant since it first launched three years ago in Dubai (which is a lifetime in this city). As such, staff are more than proficient at recommending drink pairing, and talking through different courses on the menu. Despite the large number of dishes, our waiter timed the meal perfectly. Relaxed and laidback. It’s one of the few venues that serves good food but emphasises a casual atmosphere. The evenings are usually busy, and there’s a no-booking policy (so make sure to arrive early for a good seat). There’s also a bar to the right of the entrance where you can grab an aperitif or after dinner drink. 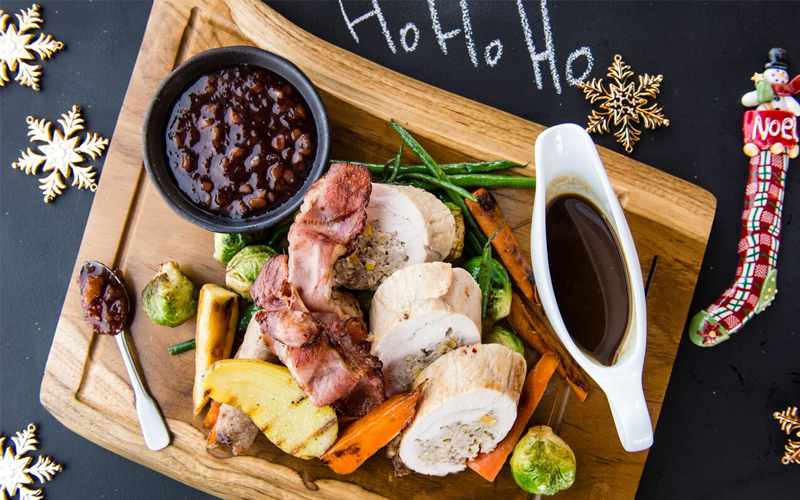 * AED 195 (plus AED 189 with beverages) per person for the Christmas brunch (served 12-4pm, 23rd -25th December) at both Fume Pier 7 and Fume Downtown Dubai. NB only the Pier 7 venue has a drinks license. Dishes from the menu will also be available, individually priced from 20th to 26th December in both restaurants. To view the menu, click here. For more information click here.